Kudos to the Rendezvous! 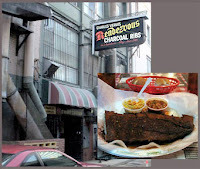 Long "the" place to eat ribs downtown and just a short walk from the River, Charlie Vergos' Rendezvous is now officially certified by Project Green Fork as environmentally sustainable. But that's not the only good news for the 63-year-old family-owned restaurant. A favorite of Actress Ginnifer Goodwin, the Rendezvous' BBQ ribs were listed as a "Great Idea" in the 4th of July "People Magazine." In 1948, Charlie Vergos cleaned out a basement below his diner, discovered a coal chute, and used his grilling skills to start a legend. Located in the alley behind 52 S. 2nd Street, the downtown institution has served Elvis, Jerry Lee Lewis, the Rolling Stones, and scores of regular Memphians and visitors. Now, they've abandoned Styrofoam and, among other things, switched to "green" cleaners, composting, and replaced plastic utensils with cutlery made from potatoes. Click HERE for the story in the Daily News, and head down for some mouth watering barbecue.